The Models ARL-9000 and ARL-9100 Automated Radiosonde Launchers (ARL) are low cost systems that permit unattended upper air observations. They are robust and fault-tolerant systems that automate radiosonde observations. They are compatible with a variety of commercial radiosondes. The ARL is ideal for remote locations, manpower limited operations, and mobile requirements. The ARL takes a manually intensive task and reduces it to a periodic maintenance routine. Because the ARL automates every step in the launch process it frees personnel to perform more important value-added tasks, and virtually eliminates human errors. At remote sites, it reduces exposure of personnel to hazardous and/or undesirable environmental conditions. 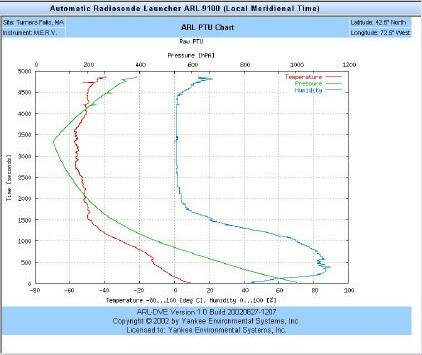 The Automated Radiosonde Launcher (ARL) is a low cost system that permits unattended upper air observations. It is a robust and fault-tolerant system that automates radiosonde observations. It is compatible with a variety of commercial radiosondes. The ARL is ideal for remote locations, manpower limited operations, and mobile requirements. The ARL takes a manually intensive task and reduces it to a periodic maintenance routine. Because the it automates every step in the launch process personnel are free to perform more important value-added tasks, and human errors are eliminated. Model ARL-9000: The fixed-base system processes up to 8 upper air observations automatically. The ARL reduces manpower costs, while increasing data availability. Model ARL-9001: The trailer-mounted mobile system processes up to 8 upper air observations automatically. Operational Weather: Permanent upper air observing system for commercial and military applications. Mobile and tactical options available. The system software runs on a core CPU running YESDAQ, a mySQL-based database with ODBC connectivity. The software manages ground support equipment and handles paper tapes. Because it provides web access to upper air data and system status, it can be remotely controlled. For example, with the click of a mouse, remote users can optionally control the release of a balloon for compliance with ATC/controlled airspace regulations. The software architecture permits hundreds of remote ARL stations to be centrally controlled. Radiosondes and expendables including helium gas, batteries and up to 600g balloons are loaded into the system. Each "channel" holds a single radiosonde in a launch carrier that manages the balloon inflation process and battery wetting. Expendables can be stored on or off site. At the center of the system is the Auto Launcher Executive (ALEX) a TCP/IP based remote control MS-Windows application that buffers you from the control language the core embedded controller uses to talk to the METHUB Met Data Receiver. Once released, the METHUB receives and stores in-flight data. Once stored, radiosonde data is displayed in web browser locally on a PC or workstation in a variety of meteorological formats. Skew-T charts, linear Pressure, Temperature, Humidity (PTU) or text displays are supported. Managing a network of upper air sites for an extended period of time produces a sizable data repository. Upper air data are collected and stored for later display or further analysis in YESDAQ, a mySQL-based open source relational database supporting ODBC, JDBC, Perl and native mySQL driver connectivity. System profiles are stored permitting site quality control. The ARL was developed in partnership with the US Dept of Energy and NOAA.